June 22, 1946: My grandparents, Elsie and Mike Flanagan, on their wedding day…4 weeks after the night they first met. Blame it on The War. Blame it on them both having a hard lonely childhood. Blame it on….love. My grandparents, Michael John Flanagan and Elsie Charlotte Hayes — my second parents — were married 66 years ago today. I wish I had known this story while they were both alive. Because every family, and every family history, needs a love story like this. I’d have loved to have interviewed them about “that night”. It wasn’t until I became a genealogist that I pieced together the dates and learned their story. There was no long engagement or courtship. There was no meeting the parents. There wasn’t even much time to think about it. May 23, 1946: The night my grandparents first met. Grandpa is on the far right. Grandma is next to him, snuggling up to her date. My wonderful adorable loving affectionate grandparents met each other on the evening of May 23, 1946 — on Grandpa’s 19th birthday. Grandma was dating Grandpa’s Navy buddy (the guy snuggled up to her). 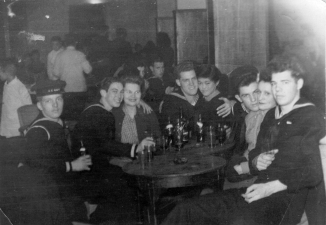 Grandpa’s Navy buddies were going out on the town that night. I think “the town” was San Francisco, because Grandpa was based out of the Alameda Naval Station. But Grandpa didn’t have a date. Yet his buddies insisted he come along anyway and go stag since it was his birthday. And it just ain’t right for a Navy man to spend his birthday alone. When it came time for the girls to head home, Grandma kissed her date goodbye — Grandpa’s buddy. Then my grandfather — the biggest charmer in the world, who never cared if he made a fool out of himself — asked her, “Can I have one of those, too?”. And my shy grandma gave him a kiss. She never dated his buddy again. And they were married less than one month later. 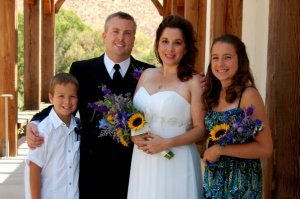 Their marriage, while far from perfect, lasted until Grandma died in 1992. 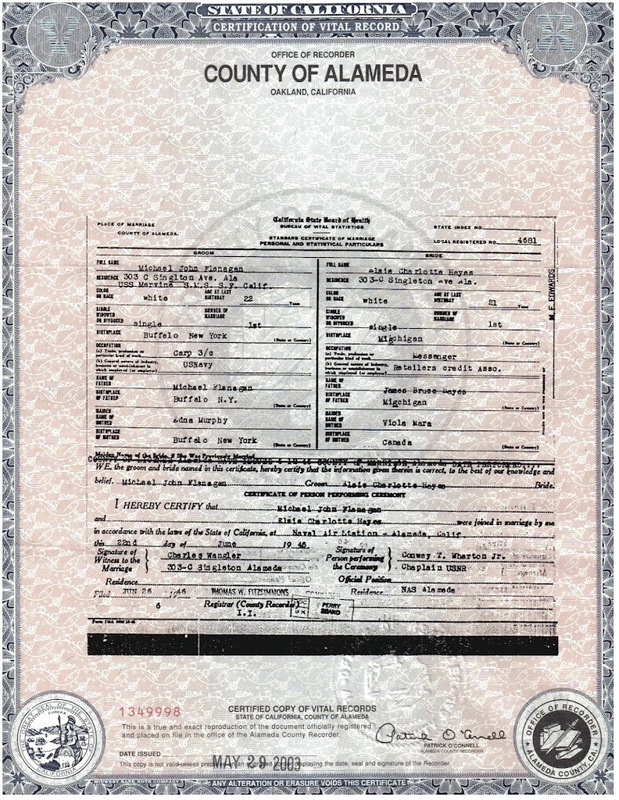 Mike and Elsie’s marriage certificate. Click on the image to view a larger copy. Grandma and Grandpa’s wedding picture was on display in our home my entire childhood. I didn’t discover the “first date” photo until after their death, when I got hooked on family history and started scouring through photos that my mom had and my aunt had. I recognized Grandpa in that photo, and I am pretty sure I saw it as a kid. 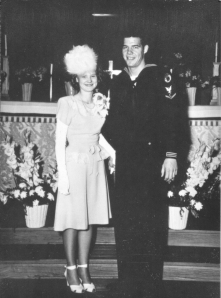 But, I never realized that flirty looking young woman, snuggled up to another sailor, and wearing red lipstick, was my grandmother. To me, after all these years of researching photos, that still does not look like Grandma. But my mother and my aunts have all repeatedly told me that yes, that is Grandma, and that she showed them that photo many times pointing herself out and telling them the story. One important fact to note from the marriage certificate. Pay attention to the name that Grandpa listed as his mother — Edna Murphy. Edna (Murphy) Buckley was my grandfather’s foster sister-in-law — the only real mother he ever knew since Grandpa was orphaned as a toddler. My husbands parents got married three months after they met in 1941. I think they did that because they wanted to sleep together. The soldiers and sailors had no idea if they would ever return. Claudia: I’ve heard that about many WWII marriages. My grandparents met and married after the war. Colleen, thanks for sharing that charming story! I’m so glad that family members do pass these stories and explanations of photographs along to the next generation–or else you’d never know that was your own grandmother in that photo! Jacqui: Thank you, and I agree. As one who has inherited many old unidentified family photos, I feel so at loss that none of my living relations know who some of the people are in those photos. Love that story! I recently had a post about writing about romance and I’ve added a link to this story as a wonderful example! Your love for your grandparents is so obvious. It’s a beautiful tribute.